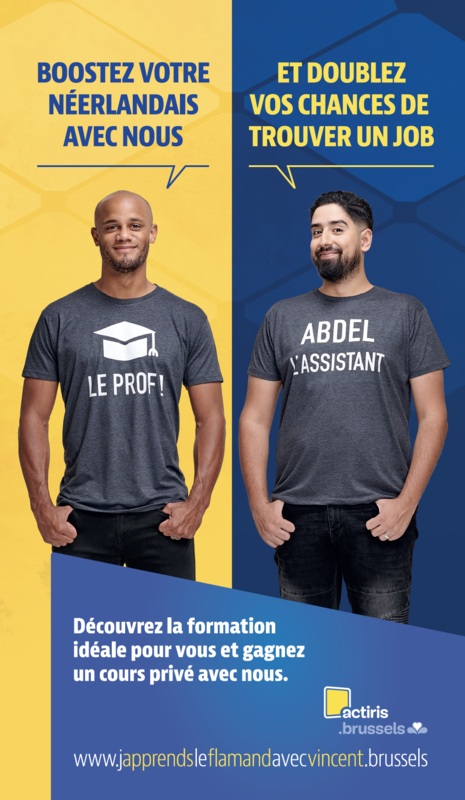 In this year’s campaign, Vincent Kompany becomes a personal teacher for Brussels’ job-seekers. In this unique occasion, the captain of our national football team will be giving a personal course of Dutch to a group of job-seekers. Because even with a little knowledge of Dutch, you almost double your chances on the job market. Job-seekers only have to surf to www.japprendsleflamandavecvincent.brussels to find a language course that suits them, and to get a chance of becoming a student in Kompany’s classroom. Vincent Kompany is assisted by another Brussels’ role model and YouTube-star Abdel en Vrai. On his social media channel, he will encourage youngsters to take part in the campaign. The campaign runs in cinema, on radio, outdoor billboards, print and social.